The contribution of Hilal Computers - Saudi Arabia to the Jazan Gas Project was recognised by Air Products at a ceremony in Jazan recently. Jazan Gas Project, the world’s largest industrial gas complex, will supply 75,000 metric tons of gas per day to Saudi Aramco’s refinery being built in Jazan. The complex, a joint venture between Saudi Aramco, Acwa Power and Air Products, will produce 20,000 metric tons of oxygen and 55,000 metric tons of nitrogen. At the event titled “Safe Achievement of Mechanical Completion” Hilal Computers - Saudi Arabia (a sister company of Hilal Computers, Bahrain) was recognised by the joint venture partners of Jazan Gas for its safety and delivery record while contributing to the digital transformation requirements of the project. 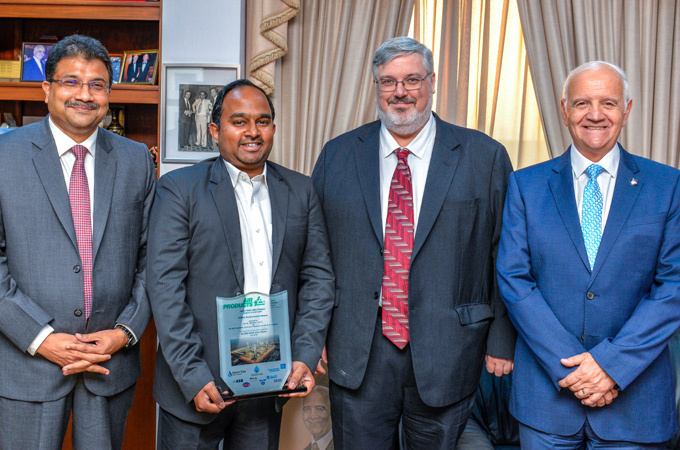 Receiving the award on behalf of Hilal Computers, the company’s managing director, Ronnie Middleton, said: “The award by Air Products is recognition of the industry standards delivered by Hilal Computers, which reflect the quality, dedication and professionalism of the team. Our small contribution to one of the world’s monolithic energy projects has today been appreciated. Hilal Computers - Saudi Arabia has shown its capacity of service delivery for future transformational projects in Saudi Arabia and across the GCC,” commented Middleton. “Hilal Computers managed the roll-out of 20 systems of IT protocols aligned in different domains including cybersecurity, ICT networks, server farms, cabling, enterprise network and consulting. The transformation of the internal systems took 40,000 man hours of work to complete; requiring cabling provisioned to 47 buildings, 146 FoC tests, setting up 579 UTP cables and CCTV surveillance," commented Sandeep Menon, account manager.